Those holding out hope that Ron Perlman would finally return as the Right Hand of Doom in Guillermo Del Toro’s Hellboy 3 were dealt a deathblow when it was decided that Lionsgate would reboot the franchise instead, bringing in Stranger Things star David Harbour to play Big Red. 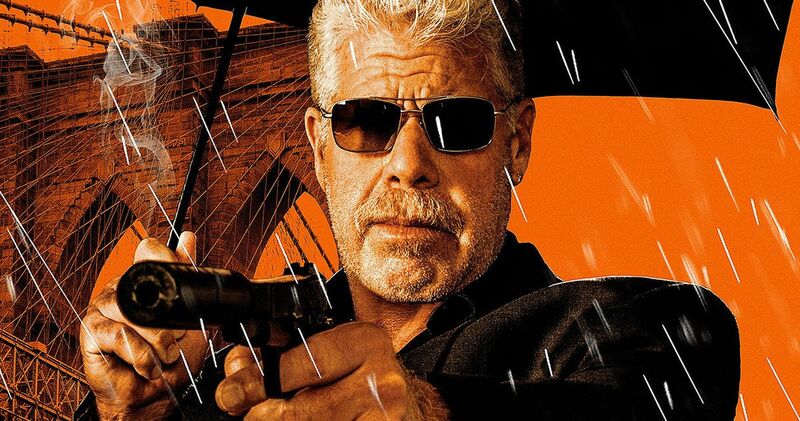 Well, now fans are being offered a little bit of relief with the news that Ron Perlman is returning to the big screen as a badass hitman for hire who’s about to retire in Asher. Momentum Pictures has released a trailer and first look poster for Asher, which shows off Ron Perlman’s very special skills as a trained killer. The thriller hits theaters on December 7 of this year. And for those agoraphobics out there that dread stepping foot in the local cinema, the action drama will also be getting a simultaneous release on VOD and Digital HD. Michael Caton-Jones is directing Asher from a script by Jay Zaretsky. Michael Caton-Jones is a long time Hollywood veteran, making his theatrical debut with the 1989 thriller Scandal starring John Hurt, Joanne Whalley and Bridget Fonda with a very memorable appearance by Ian McKellan. He’s gone onto direct such hits as 1990’s Memphis Belle, Michael J. Fox’s 1991 comedy Doc Hollywood, and the 1993 drama This Boys Life, which paired Robert De Niro and Leonardo DiCaprio. Other films listed on Michael Caton-Jones resume include Liam Neeson’s Rob Roy, The Jackal, which teamed Bruce Willis and Richard Gere, and the Robert DeNiro thriller City by the Sea. The filmmaker also has the dubious distinction of being the guy who directed Basic Instinct 2, which has gone onto become one of the most infamously bad sequels of all time. Michael Caton-Jones has assembled a pretty crazy ensemble cast for Asher. Not only did he convince Ron Perlman to take on another action movie at a time when the actor should be enjoying retirement, he also pulled in the great Famke Janssen as his love interest, and somehow conned Richard Dreyfuss into a supporting role. Also showing up to play are Peter Facinelli and Jacqueline Bisset. In Asher, Ron Perlman plays the title character, a former Mossad agent turned gun for hire, living an austere life in an ever-changing Brooklyn. Approaching the end of his career, he breaks the oath he took as a young man when he meets Sophie (Famke Janssen) on a hit gone wrong. In order to have love in his life before it’s too late, he must kill the man he was, for a chance at becoming the man he wants to be. Momentum Pictures brings us this pure shot of straight action and adrenaline. No true fan of the great Ron Perlman should miss this when it hits theaters later this winter. It looks like a lot of hard-hitting fun, and will help fill the void left by the canceled Hellboy 3.